Novak Djokovic says he is "honoured" to "be part of an elite group of tennis legends" after winning his fifth Australian Open. The world number one beat Andy Murray 7-6 (7-5) 6-7 (7-4) 6-3 6-0 in three hours and 39 minutes in Melbourne. 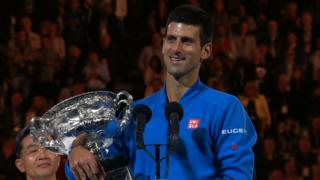 The victory is also Djokovic's eighth Grand Slam title.